The SiW-ECAL is one of the designated detector technologies for the ILC’s planned ILD detector. (Read more about it here.) Sandwiched between the tracking detectors and the hadronic calorimeter, it would measure the energies of electrons and photons emerging from the collisions, and catch the first hadronic interactions Over the years and continuous improvement of prototypes, testing and design reports, the recent beam-test saw the first realistic detector elements – meaning they could be used in a real and complete particle detector – of the ILD electromagnetic calorimeter in its near-final form under test. “The detector elements we are testing have the size and channel density that we wanted to achieve, using our latest sensor design,” says CALICE SiW-ECAL coordinator Vincent Boudry from the French Laboratoire Leprince-Ringuet (LLR). “It features the highest level of integration of our prototypes so far. For example, the electronics are now fully integrated into the detector layer instead of sitting on the outside.” “This makes it a realistic prototype and means we’re in principle ready for physics studies,” agrees Roman Poeschl from the Laboratoire de l’Accélérateur Linéaire (LAL) in Orsay. 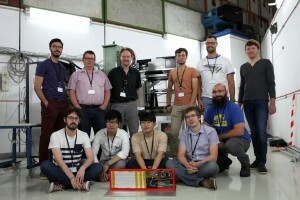 The prototype consists of seven elements of silicon glued on readout electronics boards and some 7000 calorimeter cells – a small step on the way to the designated 100 000 detector elements and 100 million cell detectors, but nevertheless a significant milestone. Tests were made with and without the absorber layers made of tungsten and with and without magnetic field – some layers have successfully been operated in a 1-Tesla magnetic field. 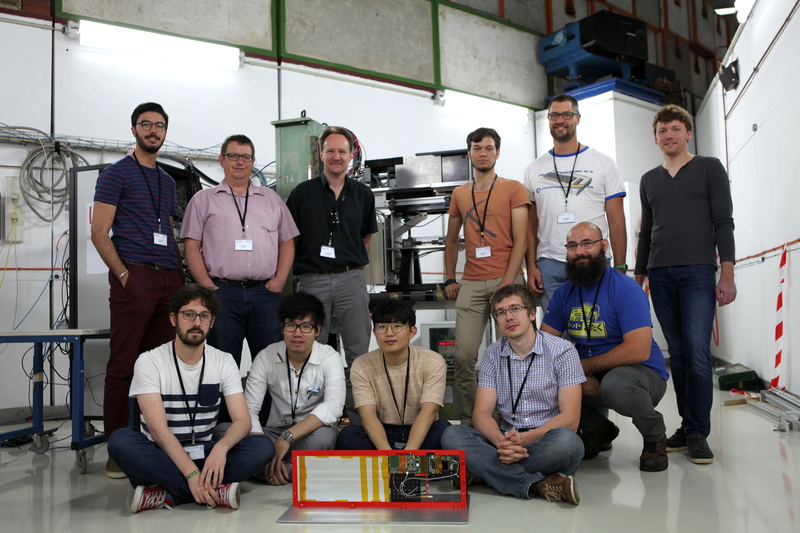 The physics and technical coordinators Adrián Irles (LAL) and Frédéric Magniette (LLR) ensured both good spirit and perfectly smooth running with some 15 shifters, researchers from France, Japan and Korea, checking whether the detector recorded events homogenously. The next steps will be to build a longer layer of several chained elements and to extend the prototype to 20 layers. The tests were made possible through funding by the European AIDA-2020 project and the French excellence cluster P2IO within the HIGHTEC project. LLR and LAL laboratories are part of the French CNRS/IN2P3.